If you want to know the record holder for the smallest fish in the world, then you're in the right place. 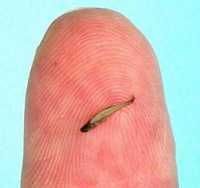 The world's smallest fish is Paedocypris progenetica, it's also the smallest vertebrate or backboned animal. Scientists have discovered this fish living in forest swamps on the Indonesian island of Sumatra. It only measures 7.9mm long (0.31 inch). Male individuals of the species anglerfish Photocorynus spiniceps have been documented to be 6.2-7.3 mm at maturity, and thus claimed to be a smaller species. However, these survive only by sexual parasitism, and the female individuals reach the significantly larger size of 50.5 mm. It's important to mention that the dwarf pygmy goby (Pandaka pygmaea) is also one of the smallest fish in the world by mass and is also one of the shortest freshwater fish as well. Mature males can reach up to 1.1 cm, while the females can grow up to 1.5 cm. Average weight is from 4 to 5 mg. It is a tropical freshwater fish of the family Gobiidae. It is known as bia and tabios in the Philippines. Check also here the largest fish or the largest mamal. For a list of the most extreme known achievements in the planet, check our top world records. Don't confuse the whale share with the blue whale. The latter is larger than the whale shark, but is considered a mammal (not a fish). In fact The blue whale is the largest mammal in the world. At 30 metres (98 ft) in length and 180 metric tons (200 short tons) or more in weight. Long and slender, the blue whale's body can be various shades of bluish-grey dorsally and somewhat lighter underneath. As with other baleen whales, its diet consists almost exclusively of small crustaceans known as krill. The largest living bony fish is the ocean sunfish (Mola mola), a member of the order Tetraodontiformes. Sunfish have been recorded at sizes as large as a length of nearly 3.6 m (12 ft), a height of 4.5 m (15 ft) from fin to fin and a weight of about 5,000 lb (2,300 kg). Much larger bony fish existed prehistorically, the largest ever known having been Leedsichthys, of the Jurassic period. Estimates of the size of this fish range from 9 m (30 ft) to 30 m (100 ft), but a maximum size of 16 m (53 ft) seems most realistic.